Curtin University Malaysia, campus in Miri, Sarawak offers a completely unique study experience. Located on the mystical island of Borneo, with the incomparable, 187 000 hectare Miri-Sibuti Coral Reef National Park just offshore, and the UNESCO World Heritage Site, Gunung Mulu National Park, a mere 45 minutes away, Curtin University Malaysia is a gateway to all of the incredible adventures to be had in East Malaysia. We help Curtin Malaysia to revise their static website into dynamic content website with content management system support, and multi-site support, which allow their different department to manage their own department website with one central site network backend, access to be control by website administrator, with user role control. 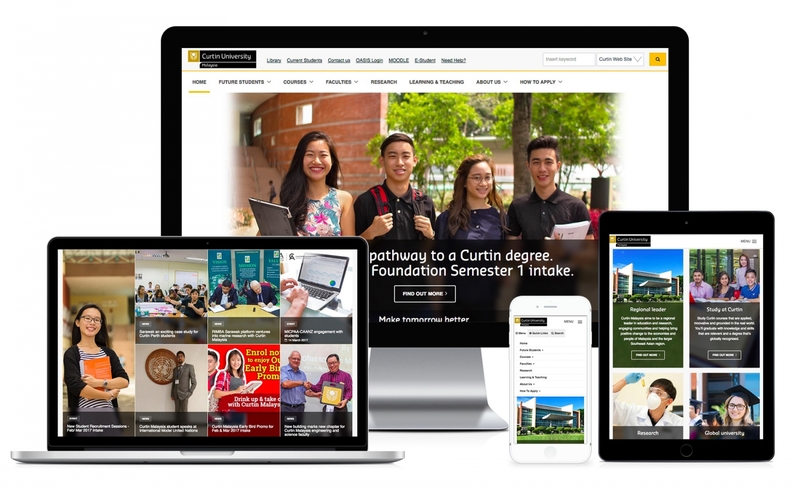 And keeping the overall identity and look match with their Curtin Australia website, with dynamic content modules that developed by us, to allow them easily insert things like tabs, accordion, parallax, banners, photo gallery, collage type banners etc. without any programming knowledge needed. Content management system, can easily manage the product/content/promotion from backend without advance programming knowledge. Multi-sites support, each department control and manage their own content and site, while top administrator fully control all the user access and role. Easy to expand and add-on more modules, custom post type in future.